Fanoush is one of those places I went to once, enjoyed, vowed to go back to soon…..and then just never got around to it. Fast-forward two years (seriously, how did that happen?!) and I was browsing the World Wide Web for some takeaway inspiration when I noticed that at some point during the last few years, Fanoush has started doing home deliveries. Instantly, I vowed to forgo my usual greasy Chinese takeout in favour of a healthy Fanoush falafel wrap. If you’re not familiar with Fanoush, then it’s a vegetarian falafel salad bar that you can find both on London Road and in the city center on Pinstone street. The menu is deceptively simple, offering a choice of salad boxes or a falafel, halloumi or feta wrap – and that’s it. Okay, so this may sound like the most boring takeaway on the face of the Earth, but things get much more exciting once you’ve chosen your wrap, as you then get to choose exactly what combination of sauce, veggies, pickles and other assorted bits and pieces you want to add to said wrap. And to sweeten the deal, most of these extras won’t cost you a penny! Even if you do opt for one of the very few items with a price tag attached, these will only set you back 50p, or 75p at the most. The one time I actually visited Fanoush in person, I loved the experience of working my way down their salad bar, pointing out exactly what I wanted adding to my wrap. Since I was ordering online, I was unsure whether I’d get the same level of choice, but Fanoush do a really good job of replicating their in-store experience. When you place an order online, the first step is choosing what kind of wrap you want (I opted for falafel and houmous, £3.75), followed by the size of your wrap (I went for 10 inches, but if you’re feeling more restrained you can go with 6 inches), the type of houmous (Jalapeno houmous) and sauce (chilli sauce). Then comes the fun part: choosing all the added extras! After much deliberation I went with cucumber, gherkin pickle, mixed peppers, onions and tomato, with halloumi (75p) and aubergine (50p). Ordering takeaway from somewhere new always feels like a bit of a gamble. Are they going to deliver on time? What if they get lost and can’t find my house? Turns out the driver did get a bit lost, but even though I had to give him directions over the phone for the last leg of the journey, he still managed to deliver the food on time, so Fanoush are certainly prompt with their delivery! When I took my falafel wrap out of the bag, first impressions were good as it felt pretty heavy, but only when I cut my wrap in half and took a peek inside did I realise just how much good stuff Fanoush had crammed into my sarnie. There’s lots going on here, but since Fanoush bills itself as a falafel bar, I’ll start with the falafel. Falafel is one of those things that’s deceptively simple, but can actually go really wrong. There’s nothing worse than crunchy, over-cooked falafel – except perhaps wet falafel, or greasy falafel that’s been cooked in too much oil. Blergh! But I’m happy to report that this falafel bar got their falafel just right. All the veggies I’d added to my wrap were fresh and crunchy and the halloumi had a nice texture, although I do prefer my halloumi on the stronger, saltier side. Fanoush’s milder halloumi ended up getting a bit lost amongst all the other flavours that were going on in my wrap. And speaking of the other flavours – wow! The dual heat from the chilli sauce and jalapeno houmous was intense. I love spicy foods and have built up quite a tolerance over the years, but this combination of chilli sauce and jalapeno houmous had me breaking out in a sweat. The chilli sauce in particular had me reaching for a big gulp of water inbetween each bite – and I loved every minute of it. If you love your spice, then give Fanoush’s chilli sauce and jalapeno houmous a whirl. It’s guaranteed to satisfy even the most hardened chilli enthusiast. And the big bold flavours just kept on coming, as Fanouh’s pickled gherkin turned out to be incredibly, eye-wateringly sour. Who said healthy vegetarian takeaway had to be boring? My Fanoush creation was bursting with flavour, thanks to those super-sour pickles and punishing chilli sauce. I wasn’t dining alone, as my friend had ordered Fanoush too. 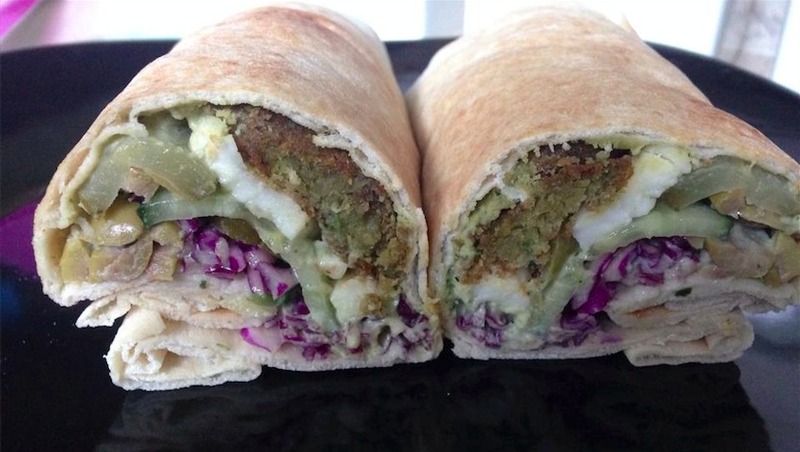 They’d opted for an equally super-sized 10 inch falafel wrap, with halloumi and coriander houmous (£5.00) plus tzatziki sauce and an assortment of veggies (onions, red cabbage and olives) and pickles (jalapeno and gherkin pickle). 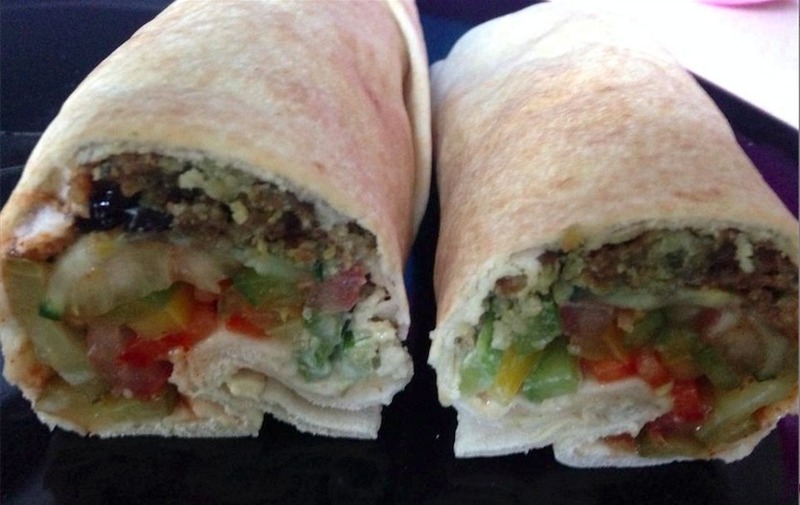 The houmous and falafel were every bit as good as in the first wrap, and all the veggies were fresh and crunchy. The only sticking point was that hardly any of the requested tzatziki sauce had found its way into the wrap, which meant the whole thing was a bit on the dry side. The lack of sauce was really strange considering how the first wrap was practically dripping with chilli sauce. Maybe on this particular day Fanoush were just running low on tzatziki? This wrap was still very tasty and filling, I just wish they’d been a bit more generous with the sauce. Since I’d waited so long before repeating my one and only Fanoush experience, I hadn’t been too sure what to expect. Would their falafel be as good as I remembered? Fanoush didn’t disappoint. Although the menu is simple, the freedom to pick and choose every ingredient that goes into your wrap more than makes up for that initial lack of choice. And there’s another major plus to getting your Friday night takeaway fix from Fanoush – it’s just so cheap! Fanoush’s wraps start at a very reasonable £3, which is less than you’d pay for some pre-packaged sarnies. In the end a pair of 10 inch, freshly-made wraps with our choice of sauce, houmous, veggies and pickles came in at exactly £10 – and Fanoush didn’t even charge for delivery! I’ve ordered a fair few takeaways in my time, and Fanoush’s takeaway is incredible value for money. 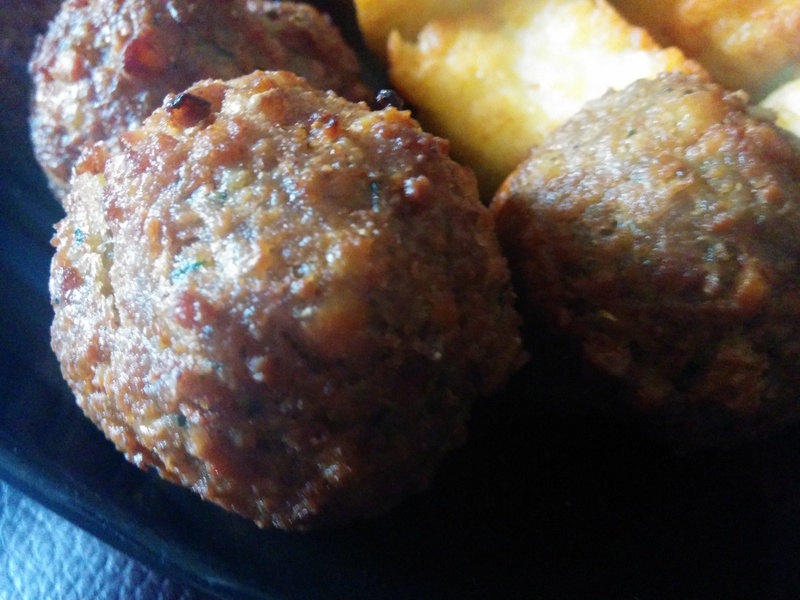 If you want a takeout treat without the guilt, then I can highly recommend some Fanoush falafel action. I’ve been meaning to tick the Greedy Greek Deli on Sharrow Vale Road off my ‘Must Try’ list for a while now, but hadn’t gotten around to it. Probably because said list is so long – and getting longer all the time! I finally ended up trying the Greedy Greek Deli for the first time on a whim. I was surfing the World Wide Web for some takeout to accompany an afternoon of horror movies, and growing increasingly frustrated that so many places don’t offer delivery until after 5 pm, when I spotted the Greedy Greek Deli in the ‘open for deliveries’ category. It was the perfect excuse to try something new! The Greedy Greek Deli’s menu is, well greek-themed (surprise, surprise), so expect lots of bread, dips, olives, and feta. The Greedy Greek is one of those places where the takeaway menu is the same as their eat-in menu, so at first glance the prices may seem high for takeout (£7.30 for two stuffed peppers?!) but rest assured, the quality of the food justifies the price. The olives are a perfect example of the thought the Greedy Greek Deli puts into their food, as you can get them stuffed with everything from chilli, to garlic, feta, sundried tomatoes, and even almonds. My only criticism, is that much of the menu is very similar. If there’s a dish you like the sound of, you can look forward to lots of variations on this theme, but if you don’t spot something tempting within the first few paragraphs, then the rest of the menu probably won’t be to your taste, either. This similarity wasn’t an issue for us, as me and my movie buddy both quickly found something we wanted to try, and placed our order. Our food arrived pretty sharpish, but I’m not sure whether this is normal for the Greedy Greek, or whether it was because we’d ordered our takeaway at such a random time. Whatever the reason, speedy delivery is always a plus! I’d opted for the Vegetarian Mixed Plate Meal; a platter of falafel, halloumi, stuffed vine leaves, olive pate, hummus, salad, pitta bread, and chips. For £12.40, this sounded like a decent amount of grub, not to mention a chance to sample lots of different things that the Greedy Greek has to offer. First up, was the salad. Not only did I get a decent portion of salad, but it came with olives and chunks of feta, neither of which I’d been expecting. A lot of restaurants use salad as a cheap way of filling up your plate, but this clearly isn’t the case with the Greedy Greek. 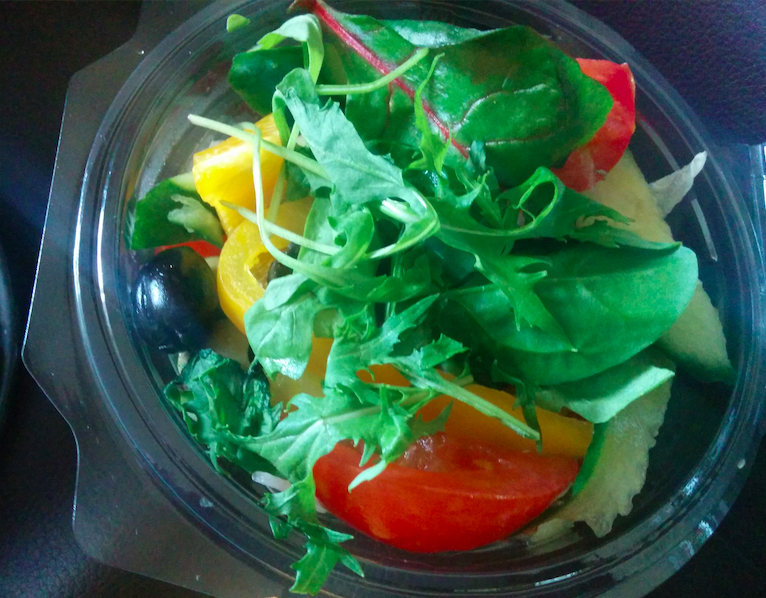 In addition to the surprise olives and feta, my salad consisted of chopped peppers, tomatoes, and a variety of green leaves – no boring old iceberg lettuce here! I’d always thought I wasn’t a fan of salads – clearly, I’ve just been eating the wrong kind of salad. When it came to the falafel, I’d been expecting a few pieces, but what I got was a huge portion of super-sized falafel. I’ve had falafel sandwiches with less falafel in them! At first glance, I was worried this was a case of quantity over quality, as the falafel looked slightly over-cooked and greasy. However, once I got past the crunchy exterior, the falafel inside was tasty, perfectly cooked, and completely free from grease. Just how filling was my falafel? Well, I actually set some aside, and had a falafel sarnie later in the afternoon. You know you’re getting your money’s worth, when you’re still eating your deli lunch at dinner time! The pitta bread was also on the large side (do you see a theme emerging?) and arrived warm, with visible grill marks, which is always a good sign. This nicely-toasted pitta was the perfect accompaniment to the perfectly-seasoned chips, which were so plentiful, they actually took up half my plate! The chips were nicely-cooked, and had a crispy skin; after all the dodgy, soggy chip takeaways I’ve had over the years, this was something of a revelation. Greedy Greek Deli, you’ve restored my faith in takeaway chips! Both the olive pate and the hummus were tasty dips; ideal for adding an extra dash of Greek flavour to my chips and pitta bread. After so many extra-large servings of extra-nice food, I finally hit a snag. Annoyingly, my issue was with the part of the platter I’d been looking forward to the most: the stuffed vine leaves. The vine leaves themselves were slimy and tasted overwhelmingly of vinegar, and the filling of mushed-up rice had a really weird texture. 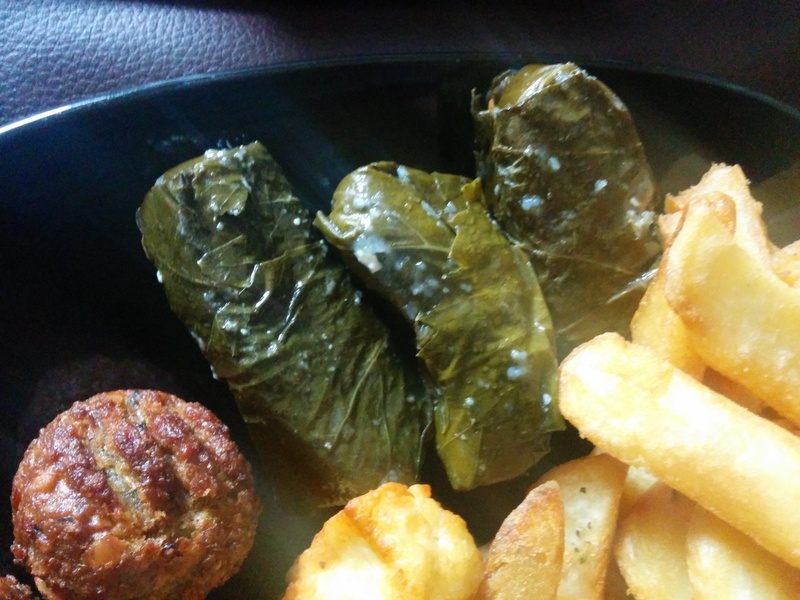 My DVD buddy’s order also included some stuffed vine leaves, and they too expressed dislike for the eye-watering vine leaves and squishy rice filling. Clearly, neither of us are cut out for the world of stuffed vine leaves! Things improved for the final part of my epic Greek feast, as I tucked into my halloumi. This halloumi may have been a little tough on the outside, but once I chewed through the skin, the halloumi inside was deliciously soft and subtly salty. This was my favourite part of the platter and, luckily for me, there was plenty of halloumi for me to enjoy. My Greedy Greek Deli platter was a saga of greek delights, where my only real complaint was that the portions were too large, for the type of food involved. 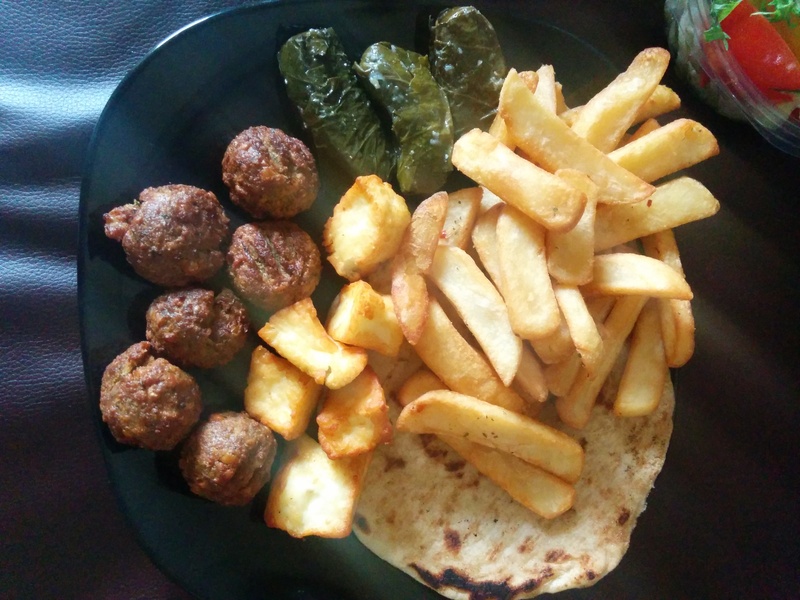 The fried falafel, fried halloumi, mountain of chips, and extra-large pitta bread, had me wishing I could trade some of it in for extra salad. I’d order the Vegetarian Mixed Plate Meal again, but only as a sharer. This is a varied, eclectic Greek feast, and a great introduction to the Greedy Greek’s menu – but it’s a bit scary when consumed as a meal for one! 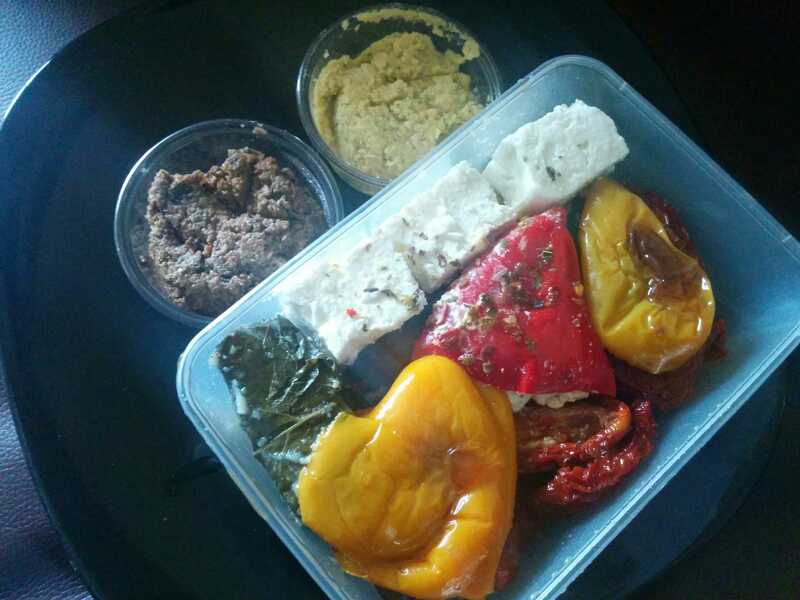 My partner in crime had shown a little more restraint and ordered a Mini Meze of stuffed peppers with feta cheese, olives, sundried tomatoes and stuffed vine leaves (£7.50). The Greedy Greek seem to be on a mission to ply their customers with as much feta as possible, as not only were the peppers crammed full of feta (as advertised), but there were big chunks of feta on the side, too. That’s a serious amount of cheese! The peppers themselves were incredibly tart. At first, this was a delicious shock to the tastebuds, but as my friend moved onto the second and third stuffed peppers, the taste of vinegar became overwhelming. With so many peppers to plough through, they’d have preferred a less-is-more approach with the vinegar. They thoroughly enjoyed the sun-dried tomatoes though, which were zingy, and packed an intense, sun-dried flavour, while still retaining a soft and chewy center. All in all, we enjoyed our Greek Deli experience. The Greedy Greek Deli is all about quality, authentic ingredients, and super-sized portions. If you fancy a change from your usual lunchtime fodder, then the Greedy Greek Deli is well worth a go. I know where I’ll be heading, the next time I fancy a big helping of halloumi, falafel, or salad!